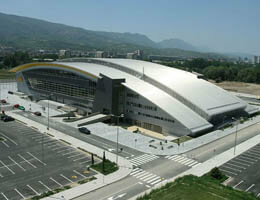 The Boris Trajkovski Sports Hall is multifunctional sports and cultural centre. It is named after the former President of the Former Yugoslav Republic of Macedonia Boris Trajkovski, who died in 2004. It also includes smaller basketball and volleyball halls, bowling court, fitness centre and press area. The larger hall is suitable for music concerts with a capacity of 10,000 spectators with four restaurants and sports bar. The hall also has VIP bar and special VIP seats for sports events. The video monitoring system records the spectators' area, which is a breakthrough in security standards. There are parking places for 800 cars, 32 buses and three SNG cars. The Sports Hall has a capacity of 6,000 fixed seats (for handball matches). There are also 2,000 removable seats. Sport hall “Boris Trajkovski” is located in Karposh municipality next to a 5-star hotel “Aleksandar Palace” near City park. It is approximately 5 kms away from the city centre, less than 2 kms from the city zoo. “Boris Trajkovski” Sports Hall The "Boris Trajkovski" Sports Hall in Skopje will be the venue of the semi-finals and finals of EURO2008. e-mail: boristrajkovski@mt.net.mk Max. hall capacity: 6963, 5963 seats.